Looking for a New Audi A8 in your area? 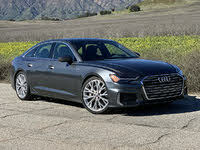 CarGurus has 308 nationwide Audi A8 dealers with 1,943 new car listings. The Audi A8, the automaker’s flagship model, was last redesigned for 2012. Since then, nearly all of its competitors have released updated models. Not to be outdone, Audi is releasing its next generation of the A8 for 2019. At the front, the new A8 sports its own interpretation of Audi’s latest hexagonal grille. It’s still full height, but the A8’s grille is much more horizontal than vertical. Elegant trapezoidal matrix LED headlights fit neatly within the contours of its upper notches and there’s more horizontal grille-work at the bottom to seamlessly integrate the fog lights. The A8 has historically suffered from unflattering proportions as a result of having its engine slung ahead of the front axle, but the redesigned 2019 model manages to visually shrink the amount of front overhang. Each side has subtle muscle bulges centered around the wheels, and a single, uninterrupted glass area whose upper border is one graceful arch that follows the roofline. In the back, there’s a full-width LED light bar not seen on any other Audi model and dual chrome exhaust tips with thin division lines inside each one. Call it an artful simplification of the outgoing A8’s shape. Like the rest of its lineage, the 2019 Audi A8 is understated for its class, but it continues to exude prestige. As with the current model, the A8 will only come in the long-wheelbase variant, which now measures 208.7 inches. The interior is similarly transformed. Some design choices, like the lower center stack that makes a smooth 45-degree transition into the center console, remain, but everything is cleaner-looking. The upper dashboard is defined by one hard edge that curves around the instrument panel and flows into each door. Audi uses vents that are semi-concealed when deployed and invisible when not, hidden behind a door on the wood trim panel. The center stack is made up of one monolithic glossy panel. Both front seats are boxy, yet well-contoured. In the backseat, buyers can choose a supportive bench-seat for three or two well-appointed bucket seats. All of the wood, leather, and glass looks first-rate. At launch, Audi will offer the A8 with an all-new turbocharged 3.0-liter V6 engine paired with an 8-speed automatic transmission and standard all-wheel drive (AWD) with a self-locking center differential. A 48-volt mild-hybrid powertrain will also be incorporated. These systems combine with features like an adaptive suspension that can increase and decrease the load on each wheel individually to effectively float over imperfections, and rear-wheel steering that shrinks the turning radius and improves stability in corners. Audi has yet to cite specific figures on horsepower or torque, but expect them to be improved over those of the outgoing A8. A premium powertrain may show up as well, in the form of the S8. Always a leader in technology, the new A8 ups the ante considerably. The 10.1 inch infotainment system toward the center of the dashboard stack operates much like a smartphone, with reconfigurable icons and layouts. It can store up to seven user profiles that include everything from ambient lighting settings and navigation presets, to memory settings for the seats, mirrors, and steering column. Traditional climate control buttons are replaced with a second touch screen with intuitively-designed menus and diagrams placed lower in the center stack. The whole system employs haptic feedback, an audible click, and the top screen can be manipulated by a rotary dial. Audi uses a third LCD for the entirety of the instrument panel, which is capable of displaying navigation, audio, or driving data front-and-center in high-resolution. Lastly, the voice command system has been improved, and is capable of interpreting complete sentences about everything from the seat adjustment and climate controls to audio in an artificial intelligence-like manner. Speaking of AI, that’s what Audi calls the new A8’s suite of advanced driving technology. It’s comprised of more than 40 different functions. 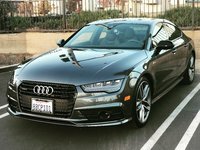 Via a suite of cameras, radars, and sensors, the A8 helps drivers maneuver in low and high-speed environments alike while avoiding costly and injurious incidents. Adaptive cruise control, automatic emergency braking with pedestrian detection, lane-keep assist, lane departure warning, cross-traffic detection, and blind-spot detection are all on the menu. Additional features like an advanced maneuvering assist feature offers steering and braking input while navigating tight garage facilities to keep drivers from colliding with hard-to-see obstacles. There’s a curb warning system that will visually alert the driver of a potential impact with a curb or a lane barrier. The automated parking system can be operated from inside or outside the vehicle, the latter controlled a smartphone app. At speeds of up to 60 miles per hour on physically divided roadways, the A8 is capable of Level 3 autonomous driving, which is to say, it can almost completely take over driving duties. Even in an imminent collision, the A8 is smarter than most cars. If it detects a side impact of greater than 15 miles per hour is about to take place between it and another vehicle, it raises the car by 3.1 inches in under a second, so that the other vehicle collides with a reinforced portion of the car. The 2019 A8 is a technological tour-de-force wrapped up in subtle German design. Anything the previous model did well, the new model does better. Look for all-new fourth generation 2019 Audi A8 to arrive in the fall of 2018. 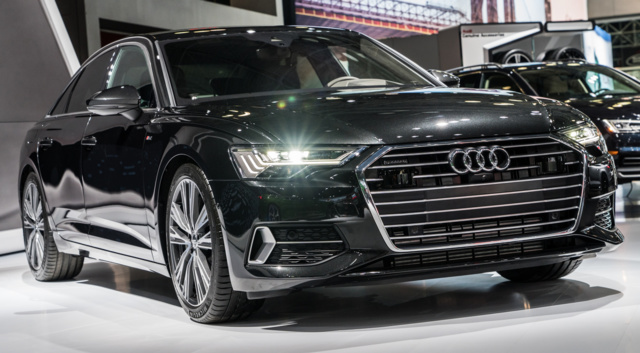 What's your take on the 2019 Audi A8? Have you driven a 2019 Audi A8? Enter your zip to see incentives for a new A8 in your area.